Tomography is a form of imaging an object in three dimensions and can be used for anatomy. Tomography is done by... Allowing the film & tube to move along the Fulcrum during an exposure. Tomography purpose is... A special type of imaging used to obtain an image of a specific layer of tissue. Other terms that describe Tomography are... 1. Planography 2. Laminography 3. Straightography 4. Body Section Radiography. A Tomogram is... A radiograph which is produced by a Tomo unit. A Fulcrum is... The pivot point of the connecting rod between the X-ray tube & film. The Fulcrum Level is... The distance measured in CM or Inches from the top of the table to the Fulcrum. An Object Plane or (Focal Plane) is... The plane in which the object is clear & in focus. The Sectional Thickness is... The thickness of an object or Focal Plane. An Exposure Angle is... The angle resulting from X-ray beam improvement. Tube movement is... The distance the tube travels. Amplitude is... The speed of the tube movement. Tube Trajectory is... The blurring pattern of the tube movement. Blur is... The area of distortion of objects outside the object plane. Blur Margin is... The outer edge of the blurred object. 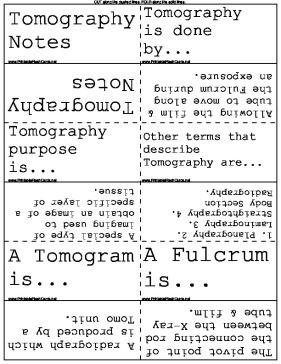 Fulcrum Types are... 1. Fixed - Are most often used with multi-directional Tomo units. 2. Variable - The Fulcrum level can be moved in relation to the patient.